There’s a reason why Crabs Adjust Humidity, Humanity Hates Trump and Cards & Punishment might sound familiar. Their cards might look familiar, too—so familiar that the popular card game Cards Against Humanity has been forced to buckle down on those and several other lookalikes. In May, Cards Against Humanity pushed to remove Humanity Hates Trump from Kickstarter, where the self-described “expansion pack to Cards Against Humanity”—unofficially, of course—had raised over $20,000 dollars. Kickstarter obligingly erased the game’s fundraising campaign to avoid an intellectual property dispute. Humanity Hates Trump’s creator, the toy company SCS Direct, claims “corporate bullying.” In April, SCS Direct filed a complaint with the District Court for the District of Connecticut alleging that the popular card game “wrongfully and without justification made infringement assertions” against them. Humanity Hates Trump hasn’t yet served the complaint, so no one there has received it in a formal legal sense. They say they want to work it out outside court. Humanity Hates Trump, published by toy company SCS Direct, did monetize their product. “Make ________ great again” is one of their black cards, which white cards like “Dating your daughter” and “A Huuuge wall that the Mexicans will pay for” can complete. Check Amazon and you’ll find it for a swell $28 ($25 on their site—the same price as Cards Against Humanity). Not to be partisan, SCS Direct also sells a set of cards called Humanity Hates Hillary, Too. The Amazon pages for both games note that customers who purchase them also regularly buy Cards Against Humanity. Like other tabletop creators who wanted to get in on the Cards Against Humanity gravy train without going broke, Humanity Hates Trump’s creators will tell you that they’re in the same “genre” as Cards Against Humanity. It’s not an expansion. It’s not a fan interpretation. SCS Direct owner Howard Greenspan told me that Humanity Hates Trump is a “base game.” But, for a base game, it sure looks a lot like Cards Against Humanity. Since its now-removed Kickstarter campaign, Humanity Hates Trump still has black and white cards. The mechanics, of course, are fill-in-the-blank. Their logo is on the bottom left. Their font was Helvetica-like, but is no longer. And, to boot, their name had the tagline, “Cards Against Everybody.” Seem familiar? Greenspan told me that Cards Against Humanity has dominated the gaming card industry. And he doesn’t think it’s fair. “People will not produce games that compete against them just for fear of lawsuit,” he said. Cards Against Humanity kind of has to be a bully in these situations. While they encourage lookalikes, Cards Against Humanity draws the line at what co-creator Max Temkin calls “commercial exploitation.” Trade dress, a kind of intellectual property that applies to the general look of a product, is what’s at play. Just think of how Coca-Cola’s glass bottle signifies their brand—that’s trade dress. If a company doesn’t assert their ownership of a “look,” they might lose it. 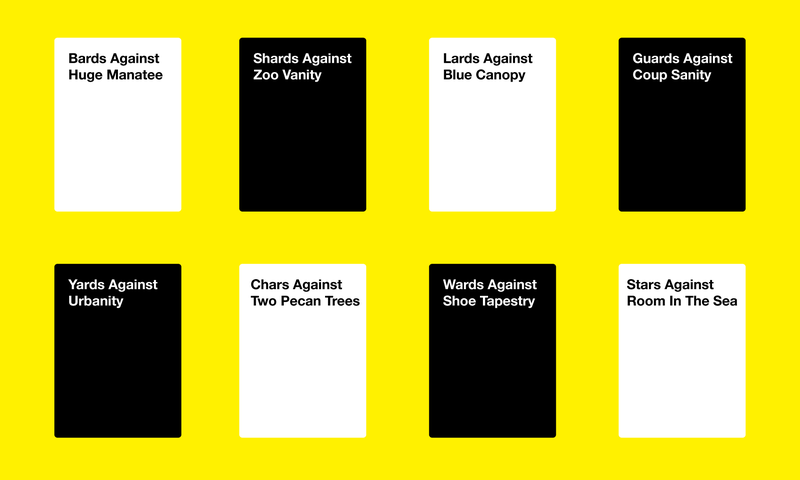 Video game lawyer Stephen McArthur, who says he is fascinated by the back-and-forth between Cards Against Humanity and games in its genre, published a blog post weighing in favor of Cards Against Humanity. Humanity Hates Trump went too far, he wrote. But he thinks Cards Against Humanity asserted their design trade dress inconsistently. “It will have a harder time making that argument in court now that it has presumably overlooked over a dozen other competitors and copycats using the exact same design aesthetic,” he said. Over the phone, McArthur elaborated that, “If Cards Against Humanity is the only game out there with black and white cards and that gameplay, if you see a second one, you’ll think it’s Cards Against Humanity. But if it’s 19-20 of them, you’re not gonna think it’s Cards Against Humanity.” When “likelihood for confusion” is the benchmark for asserting trade dress, having 19-20 lookalikes of a product can erode away that likelihood. Temkin’s advice for those hypothetical 19-20 games “isn’t to copy how Cards Against Humanity looks or try to trick people into thinking we made your game. It’s actually much more valuable to stand out and develop your own audience,” he told me. In the competitive world of party games, who can say whether that’s true. On Kickstarter.HumanityHatesTrump.com*, not actually Kickstarter, you can still “pledge” and receive any of ten Humanity Hates Trump packs. Humanity Hates Trump will continue to do business as long as they can on Amazon and around the web, although they’re still bitter about the plush $20,000 they missed out on. Amazon continues to direct interested consumers to Cards Against Humanity’s page. [Update—5:05 PM]: A mention of Apples to Apples, the game that inspired Cards Against Humanity, was accidentally cut during the editing of this piece, so we’ve re-added it. *Kickstarter.HumanityHatesTrump.com has gone down since this article’s publication.